Yeovil (/ˈjoʊvəl/ YOH-vəl) is an English town and civil parish in the district of South Somerset, with a population of 45,000. It is close to Somerset's southern border with Dorset, 130 miles (210 km) from London, 40 miles (64 km) south of Bristol, 6 miles (9.7 km) from Sherborne and 30 miles (48 km) from Taunton. The aircraft and defence industries developed in the 20th century made it a target for bombing in the Second World War. They are still major employers. Yeovil Country Park, which includes Ninesprings, is one of several open spaces with educational, cultural and sporting facilities. Religious sites include the 14th-century Church of St John the Baptist. The town is on the A30 and A37 roads and has two railway stations. Archaeological surveys of the town have yielded palaeolithic remains, in the shape of burial and settlement sites mainly to the south of the modern town, particularly in Hendford where a Bronze Age golden torc (twisted collar) was found. Yeovil is on the main Roman road from Dorchester to the Fosse Way at Ilchester. The route of the old road is aligned with the A37 from Dorchester, Hendford Hill, Rustywell, across the Westland site, to Larkhill Road and Vagg Lane, rejoining the A37 at the Halfway House pub on the Ilchester Road. The Westland site has evidence of a small Roman town. There were several Roman villas (estates) in the area, including finds at East Coker, West Coker and Lufton. Yeovil was first mentioned in a Saxon charter dated 880 as Gifle. The name derives from the Celtic river-name gifl "forked river", an earlier name of the River Yeo. The estate was bequeathed in the will of King Alfred the Great to his youngest son Aethelweard. It was recorded in the Domesday Book as Givele, a thriving market community. The parish of Yeovil was part of the Stone Hundred. After the Norman Conquest the manor, later known as Hendford, was granted to the Count of Eu and his tenant Hugh Maltravers, whose descendants became Earls of Arundel and held the lordship until 1561. In 1205 it was granted a charter by King John. By the 14th century, the town had gained the right to elect a portreeve. The Black Death exacted a heavy toll, killing approximately half the population. In 1499 a major fire broke out in the town, destroying many of the wooden, thatched roofed buildings. Yeovil suffered further serious fires, in 1620 and again in 1643. After the dissolution of the monasteries the lord of the manor was the family of John Horsey of Clifton Maybank from 1538 to 1610 and then by the Phelips family until 1846 when it passed to the Harbins of Newton Surmaville. Babylon Hill across the River Yeo to the south east of the town was the site of a minor skirmish, the Battle of Babylon Hill, during the English Civil War, which resulted in the Earl of Bedford's Roundheads forcing back Sir Ralph Hopton's Cavaliers to Sherborne. During the 1800s Yeovil was a centre of the glove making industry and the population expanded rapidly. In the mid-19th century it became connected to the rest of Britain by a complex set of railway lines which resulted from competition between the 7 ft (2,134 mm) broad gauge lines of the Great Western Railway (GWR) and the 4 ft 8 1⁄2 in (1,435 mm) standard gauge lines of the London and South Western Railway (LSWR). In 1853 the Great Western Railway line was opened between Taunton and Yeovil. The first railway in the town was a branch line from the Bristol and Exeter Railway near Taunton to a terminus at Hendford on the western side of the town, which opened on 1 October 1853. As an associated company of the GWR, this was a broad gauge line. The GWR itself opened Yeovil Pen Mill railway station on the east side of the town as part of its route from London on 1 September 1856 (this was extended to Weymouth on 1 January 1857), and the original line from Taunton was connected to this. The LSWR route from London reached Hendford on 1 June 1860 but a month later the town was by-passed by the extension of the LSWR to Exeter. A new station at Yeovil Junction was provided south of the town from where passengers could catch a connecting service to Hendford. On 1 June 1861 passenger trains were withdrawn from Hendford and transferred to a new, more central, Yeovil Town railway station. In 1854, the town gained borough status and had its first mayor. In the early 20th century Yeovil had around 11,000 inhabitants and was dominated by the defence industry, making it a target of German raids during World War II. The worst of the bombing was in 1940 and continued until 1942. During that time 107 high explosive bombs fell on the town. 49 people died, 68 houses were totally destroyed and 2,377 damaged. Industrial businesses developed in the area around the Hendford railway goods station to such a degree that a small Hendford Halt was opened on 2 May 1932 for passengers travelling to and from this district, but the growth of road transport and a desire to rationalise the rail network led to half of the railway stations in Yeovil being closed in 1964. First to go was Hendford Halt which was closed on 15 June along with the line to Taunton, then Yeovil Town closed on 2 October. Long-distance trains from Pen Mill had been withdrawn on 11 September 1961 leaving only Yeovil Junction with a service to London, but the service between there and Pen Mill, the two remaining stations, was also withdrawn from 5 May 1968. Officially designated as Yeovil Municipal Borough in 1854, the town continued to lend its name to the area with the creation of the local government district of Yeovil on 1 April 1974, with the merging several neighbouring rural and urban districts, which is today known as South Somerset. Some of the suburbs fall within the civil parishes of Yeovil Without and Brympton. Yeovil still has a town council which took over the functions of the Charter Trustees in 1982. The council has responsibility for the management of recreational and leisure facilities, open spaces and play areas. In 2005, Yeovil Town Council became the first large council in Somerset to be awarded Quality Town Council status. There are five electoral wards covering Yeovil. Yeovil is a county constituency represented in the House of Commons of the Parliament of the United Kingdom. It elects one Member of Parliament (MP) by the first past the post system of election. The constituency covers the towns of Yeovil, Chard, Crewkerne and Ilminster, all in Somerset. Until 1983 Somerset was split into four constituencies and Yeovil constituency also contained the towns of Ilchester, Martock and Somerton, but these were moved into the newly created constituency of Somerton and Frome. From the next election, Yeovil constituency will contain Ilchester once again to equalise the populations of the Somerset constituencies. The Boundary Commission for England estimate the electorate of Yeovil constituency after the pending boundary changes to be 77,049. The current MP is Marcus Fysh, a member of the Conservative Party. Yeovil also forms part of the South West England constituency for elections to the European Parliament. There is, in Johannesburg, South Africa, a suburb called Yeoville which has a link to Yeovil. It was proclaimed in 1890 by one Thomas Yeo Sherwell, a native of Yeovil. He named the streets after his sons, friends and business associates. Yeovil is situated at the southern boundary of Somerset, close to the border with Dorset, 130 miles (209 km) from London, 40 miles (64 km) south of Bristol and 30 miles (48 km) from Taunton. It lies in the centre of the Yeovil Scarplands, a major natural region of England. The suburbs include: Summerlands, Hollands, Houndstone, Preston Plucknett, Penn Mill, New Town, Hendford, Old Town, Forest Hill, Abbey Manor, Great Lyde. Outlying villages include East Coker, West Coker, Hardington Mandeville, Evershot, Halstock, Stoford, Barwick, Sutton Bingham, Mudford and Yetminster. Other nearby villages include Bradford Abbas, Thornford Corscombe, Montacute (where one will find Montacute House), and Pendomer. The village of Brympton, now almost a suburb of Yeovil, contains the medieval manor of Brympton d'Evercy. Tintinhull is also a village close to Yeovil featuring the National Trust owned Tintinhull House and Gardens. Ninesprings Country Park is in the south east near Penn Hill. It is linked to by a cycleway following the route of the old railway to Riverside Walk, Wyndham Hill and Summerhouse Hill forming the 40-hectare (99-acre) Yeovil Country Park. Along with the rest of South West England, Yeovil has a temperate climate which is generally wetter and milder than the rest of the country. The annual mean temperature is approximately 10 °C (50.0 °F) and shows a seasonal and a diurnal variation, but due to the modifying effect of the sea the range is less than in most other parts of the UK. January is the coldest month with mean minimum temperatures between 1 °C (33.8 °F) and 2 °C (35.6 °F). July and August are the warmest months in the region with mean daily maxima around 22 °C (71.60 °F). The south-west of England has a favoured location with respect to the Azores high pressure when it extends its influence north-eastwards towards the UK, particularly in summer. Convective cloud often forms inland however, especially near hills, reducing the number of hours of sunshine. The average annual sunshine totals around 1,700 hours. Rainfall tends to be associated with Atlantic depressions or with convection. The Atlantic depressions are more vigorous in autumn and winter and most of the rain which falls in those seasons in the south-west is from this source. Average rainfall is about 725 millimetres (28.5 in). November to March have the highest mean wind speeds, with June to August having the lightest winds. The predominant wind direction is from the south-west. The Yeovil urban area had a population of 41,871 at the 2001 census, although in 2011 the civil parish was home to 30,378. The parish is made up of Yeovil Central Ward which has a population of 7230, Yeovil East 7300, Yeovil South 7802, and Yeovil West 7280. The urban area also includes Yeovil Without which has a population of 7260 and Brympton with 5268. AgustaWestland manufactures helicopters in Yeovil, and Normalair Garratt, (Honeywell) builder of aircraft oxygen systems, is also based in the town. Yeovil's reputation as a centre of the aircraft and defence industries lived on into the 21st century despite attempts at diversification, and the creation of numerous industrial estates, the principal employer is the aviation group AgustaWestland. This firm was created through the acquisition of Westland Helicopters by Finmeccanica in 2000. In January 1986 the proposed sale of Westland to the American Sikorsky Aircraft group led to the Westland affair, a crisis in the Thatcher government, the resignation of Michael Heseltine as Secretary of State for Defence and the resignation two weeks later of the Secretary of State for Trade and Industry, Leon Brittan, after his admission of leaking of a governmental law officer's letter which harshly criticised Mr Heseltine. 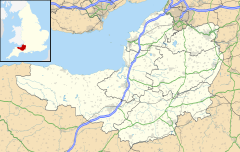 Yeovil Aerodrome (ICAO: EGHG), (sometimes known as Yeovil/Westland 'Judwin' to avoid confusion with nearby RNAS Yeovilton), is 1 nautical mile (1.9 km) west of the town centre. British defence giant BAE Systems also operate a site which produces high-integrity networked software, primarily for the military. The Screwfix Direct company is based in Houndstone, having started life as the Woodscrew Supply Company in 1979; it is now a subsidiary of Kingfisher plc. The company's warehouse was relocated to Stoke-on-Trent following failure to gain planning permission for building expansion. The Quedam Shopping Centre is a complex of around 45 shops. As well as the usual array of British high street shops, the centre houses several independent retailers and a multi-storey car park of approximately 650 spaces. In 2015, the leather manufacturer Pittards managed to buy back its 1964 purpose-built tannery in Sherborne Road, Yeovil. One of the symbols of Yeovil is "Jack the Treacle Eater", a folly consisting of a small archway topped by a turret with a statue on top. This is actually located in the village of Barwick, just to the south of the town. The hamstone Abbey Farm House was built around 1420 by John Stourton II, known as Jenkyn, and the associated Abbey Barn dates from the same period. Hendford Manor in the centre of the town was built around 1720 and has since been converted into offices. It is a Grade II* listed building. Newton Surmaville is a small park and house which is also known as Newton House. It was built between 1608 and 1612, for Robert Harbin, a Yeovil merchant. It has been designated by English Heritage as a Grade I listed building. Yeovil has two theatres; The Octagon, and The Swan, a ten-screen cinema and 18-lane ten-pin bowling alley. Yeovil District Hospital NHS Foundation Trust provides local health services. The Yeovil Railway Centre is a small railway museum at Yeovil Junction. It was created in 1993 in response to British Rail's decision to remove the turntable from Yeovil Junction. Approximately 0.25 miles (400 m) of track along the Clifton Maybank spur is used for demonstration trains. Yeovil has bus services provided by First West of England, First Hampshire & Dorset, Nordcat, South West Coaches, Stagecoach South West and Damory Coaches along with coach services from National Express, Berry's Coaches and South West Tours. There are around 62 separate bus routes serving Yeovil as at March 2009, of which four run Wednesday-Saturday nights only, and six of which run on Sundays. 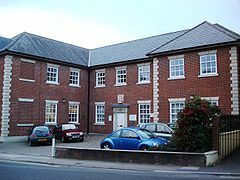 Many of the listed services serve Yeovil College. All bus routes except First West of England local routes towards the Western side of the town serve Yeovil bus station. Further education in Yeovil is principally offered by Yeovil College, with land-based studies available through a Yeovil centre of Bridgwater College, and some provision through private providers. It also contains one higher education university centre, University Centre Yeovil. The registered awarding body for the university centre is primarily Bournemouth University with University of the West of England offering some additional courses. Secondary education in Yeovil is provided by four schools. Westfield Academy is situated on Stiby Road. It has four main buildings on site and over 15 different facilities. Preston School, with specialist Business and Enterprise College status, was opened in 1961 and celebrated its 50th anniversary in 2011. Past pupils include the actress, Sarah Parish. Bucklers Mead Academy has specialist Music and Technology Facilities. Past pupils include Sir Ian Botham. The Park School, situated near to the centre of the town, is Yeovil's independent school offering co-education for day students and boarders. The Anglican Church of St John The Baptist dates from the late 14th century. The tower is 92 feet (28 m) high, in four stages with set-back offset corner buttresses. It is capped by openwork balustrading matching the parapets which are from the 19th century. There are two-light late-14th-century windows on all sides at bell-ringing and bell-chamber levels, the latter having fine pierced stonework grilles. There is a stair turret to the northwest corner, with a weather vane termination. The church has been designated by English Heritage as a grade I listed building. Yeovil also has a Roman Catholic church (Holy Ghost Church), three Methodist Churches – Preston Road, St Marks (Chelston Avenue) and Vicarage Street (Town Centre), a Baptist church in South Street, Salvation Army, Elim Pentecostal Church, Yeovil Community Church (Evangelical, based at "The GateWay"), Yeovil Family Church (New Frontiers), and several other Anglican churches. There is a mosque located on Sherborne Road. In April 2006 Yeovil became the first town in Britain to institute a somewhat controversial system of biometric fingerprint scanning in nightclubs. Individuals wishing to gain access to one of the town's nightclubs were asked in the first instance to submit their personal details for inclusion in a central system. This included a photograph and index fingerprint. Thereafter, each entry to one of the participating premises required a fingerprint scan. The scheme is no longer in operation. According to Nigel J Marston, Licensing Manager of South Somerset District Council, the scheme was short-lived as, "The company that originally supplied went through various changes of ownership and the project became unsupported. This allied to several of the venues closing down lead to the death of the scheme." In February 2007, Yeovil Town Council became the first English council to ban the children's craze Heelys in the centre of the town and High Street. Skateboards, roller skates and roller blades are also illegal in the area. Councilors have stated this is due to "numerous complaints about the activities of youngsters". In late July 2007, South Somerset District Council plans were made public by the Western Gazette to build a £21 m 'Yeovil Sports Zone' on Yeovil Recreation Ground, which has been a popular open green space used by the local community for over seventy years. Residents fought to protect the Rec, leading to rejection of the proposals in 2009, and further consultations in 2010. The free, informal recreational space of Mudford Rec, as it is known colloquially, was frequented by England Cricket great Ian Botham during his childhood stay in Yeovil. Another regeneration project was to have included the demolition of Foundry House, a former glove factory, however a local campaign led to this becoming a listed building and it will now be converted into a restaurant and offices and new shop and houses will be built on the surrounding site. The town's football team, Yeovil Town F.C., play in green and white livery at Huish Park, and currently compete in Football League Two. Known as the "Glovers" (a reference to the town's glove-making past), they were founded in 1895 and won promotion to Division Three as Football Conference champions in 2003. They had achieved numerous FA Cup victories over Football League sides in the past 50 years, and since joining the league they have won promotion again – as League Two champions in 2005, and League One play-off winners in 2013. In women's football, Yeovil Town L.F.C. were founded in 1990 and won promotion to England's highest tier, the FA Women's Super League, in 2016. Other football teams within the town include Westland's Sports Football Club who play at Alvington Lane and Pen Mill Football Club. Yeovil Olympiads Athletics Club was founded in 1969, and has produced many international athletes since its creation. The first was Eric Berry who came 6th in the 1973 European Juniors in the hammer event. Olympians who started with the club include Max Robertson and Gary Jennings, both 400 metres hurdlers. Yeovil is home to Ivel Barbarians Rugby Club. Ivel was formed in 1995 by the merger of Yeovil Rugby Club and Westlands Rugby Club. South Somerset Warriors were formed in 2010 and played in the South West Division of the Rugby League Conference until folding in 2011. The Goldenstones Pool and Leisure Centre provides a 25 metres (82 ft) swimming pool, separate teaching pool, refurbished and expanded Springs gym, sauna, steam room, spectator area and work out studio. Preston Sports Centre has undergone a £800,000 refurbishment, during the development the sports hall was refurbished and built a brand new 25+ station Gym and dance studio. As well as the fitness facilities the centre also offers a number of sport development programmes for toddlers through to teenagers and also hire out the facilities. Yeovil is the location for the fictional School of Lifemanship in a series of novels by Stephen Potter: Gamesmanship (1947), Lifemanship (1950), One-Upmanship (1952), Supermanship (1958), Anti-Woo (1965) and The Complete Golf Gamesmanship (1968). The books were adapted for the 1960 film School for Scoundrels, starring Alastair Sim, Terry-Thomas, Ian Carmichael and Irene Handl. Later they were adapted by Barry Took into a BBC TV comedy series called One-Upmanship (1974–78), starring Richard Briers and Peter Jones. Yeovil is also one of the three principal locations in John Cowper Powys's 1929 novel, Wolf Solent. Yeovil is known in Thomas Hardy's Wessex as "Ivell". Local band The Chesterfields released a single called "Last train to Yeovil" and the pop band Bubblegum Splash also released a song called "18:10 to Yeovil Junction". The folk band Show of Hands wrote a song entitled "Yeovil Town" about the violence and crime they experienced after playing a small gig in Yeovil. Yeovil is mentioned by John Finnemore (writer) in his song Red Trousers. Yeovil has been the home or birthplace to several notable people. Robert Harbin who was born in 1526, was a mercer by profession, who lived and died in Yeovil. He is buried in St. John the Baptist Church. His house, located at the edge of town and named Newton Surmaville, was completed in 1612. Harbin was granted his coat of arms in May 1612 and given the title "Gentleman". He was not knighted. Stukeley Westcott was an early American (17th century) settler. and the co-founder, with Roger Williams and 11 others, of Providence, Rhode Island (1636), an early American religious freedom asylum. Alison Adburgham (1912–1997), social historian and fashion journalist, was born in the town. Michael T. Davies, a traditionalist Catholic writer and public figure was born in Yeovil in 1936, while the film historian William K. Everson was born in the town in 1929. Sportspeople from the town include: Barnsley defender Martin Cranie, Olympic pentathlete Sam Weale and his twin brother Chris Weale who is a professional goalkeeper for Yeovil Town. Heather Stanning, a rower who won a gold medal in the 2012 Olympic Games, was born in Yeovil. England Women's Rugby World Cup winner 2014, and freedom of the town holder Marlie Packer is from Yeovil. The arts are represented by Jim Cregan, a guitarist with Steve Harley & Cockney Rebel, the musician John Parish, and his younger sister the actress Sarah Parish. Rock drummer Andy (Andrew) Hawtin was born in Yeovil in 1979, living in East Coker until 1986. The artist Flora Twort was born in Yeovil in 1893. ^ a b c "Yeovil Economic Profile" (web page). Somerset Intelligence. Retrieved 2 April 2015. ^ a b c d Gathercole, Clare (2003). "An archaeological assessment of Yeovil" (PDF). English Heritage Extensive Urban Survey. Somerset County Council. pp. 5–6. Archived from the original (PDF) on 1 February 2010. Retrieved 1 February 2010. ^ a b c d Bush, Robin (1994). Somerset: The Complete Guide. Wimbourne: Dovecote Press. pp. 243–246. ISBN 978-1-874336-26-6. ^ "Westland". Somerset Historic Environment Record. Retrieved 20 January 2008. ^ Goodchild, John (1954). The Borough of Yeovil. Yeovil: The Mayor, Alderman and Burgesses of the Borough of Yeovil. p. 13. ^ Mills, A.D. (2003). A Dictionary of British Place-Names. Oxford: Oxford University Press. ISBN 978-0-19-852758-9. ^ Anglo-Saxon charters S 1507 (AD 873x888), King Alfred's will, translated by S. Keynes & M. Lapidge, Alfred the Great, Harmondsworth, 1983, pp.173–78, with notes on pp.313–26. Identification of the estates left to Aethelweard is based on the corresponding notes to the translation. ^ a b "Yeovil's History". Yeovil Town. Retrieved 20 January 2008. ^ "Somerset Hundreds". GENUKI. Retrieved 21 October 2011. ^ Havinden, Michael (1981). The Somerset Landscape. The making of the English landscape. London: Hodder and Stoughton. p. 113. ISBN 0-340-20116-9. ^ Lewis, Samuel (1849). "Yeading – Yettington". A Topographical Dictionary of England. British History Online. Retrieved 25 April 2010. ^ "Political awareness". Yeovil Town Council. Retrieved 23 March 2010. ^ a b Jackson, B.L. (2003). Yeovil, 150 Years of Railways. Usk: Oakwood Press. ISBN 0-85361-612-4. ^ "Former mayors of Yeovil". Yeovil Town Council. Retrieved 25 April 2010. ^ "European Air War". World War II Timelines. worldwar-2.net. Retrieved 25 April 2010. ^ "Wartime". Yoevil Town Council. Retrieved 23 March 2010. ^ "'Lost for Words'". The Guardian. Retrieved 15 February 2018. ^ "Yeovil MB". A vision of Britain Through Time. University of Portsmouth. Retrieved 4 January 2014. ^ "Yeovil Town: About". YeovilTown.com. Retrieved 1 April 2012. ^ "Activities and Responsibilities". Yeovil Town Council. Retrieved 1 February 2010. ^ "Yeovil Town Council". Yeovil Town Council. Retrieved 1 February 2010. ^ "Alphabetical List of Constituencies and Members of Parliament". House of Commons Information Office. Retrieved 10 May 2015. ^ "UK MEPs for the South West". European Parliament UK Office. Archived from the original on 27 February 2012. Retrieved 8 June 2012. ^ "Yeovil Country Park". Natural England. Retrieved 8 June 2012. ^ "Yeovil Country Park". South Somerset Council. Retrieved 22 March 2010. ^ a b c "About south-west England". Met Office. Archived from the original on 5 June 2011. Retrieved 22 March 2010. ^ "Yeovil Central" (PDF). South Somerset Council. Archived from the original (PDF) on 16 December 2007. Retrieved 24 April 2010. ^ "Yeovil East" (PDF). South Somerset Council. Archived from the original (PDF) on 16 December 2007. Retrieved 24 April 2010. ^ "Yeovil South" (PDF). South Somerset Council. Archived from the original (PDF) on 16 December 2007. Retrieved 24 April 2010. ^ "Yeovil West" (PDF). South Somerset Council. Archived from the original (PDF) on 16 December 2007. Retrieved 24 April 2010. ^ "Brympton" (PDF). South Somerset Council. Archived from the original (PDF) on 16 December 2007. Retrieved 24 April 2010. ^ "South Somerset: Total Population". A Vision of Britain Through Time. Great Britain Historical GIS Project. Retrieved 29 January 2009. ^ "History". AgustaWestland. Archived from the original on 7 July 2009. Retrieved 14 December 2007. ^ "Honeywell Normalair-Garrett". Macrae's Blue Book UK. Owen Media Partners Inc. Archived from the original on 6 October 2011. Retrieved 24 April 2010. ^ "History". AgustaWestland. Retrieved 24 April 2010. ^ Peter Jenkins, Mrs Thatcher's Revolution: The Ending of the Socialist Era (Pan, 1989), p. 192. ^ "About Screwfix". Screwfix Ltd. Retrieved 24 April 2010. ^ "Screwfix Direct Limited: annual report to 31 January 2017". Companies House. August 2017. Retrieved 6 December 2017. ^ "Staff fix needed at DIY website". BBC News. 27 September 2004. Retrieved 24 April 2010. ^ "Quedam Shopping Centre". Yeovil Town.com. Archived from the original on 2 March 2010. Retrieved 22 March 2010. ^ "Jack the Treacle Eater". Images of England. Retrieved 5 January 2008. ^ "Abbey Farm House". Images of England. English Heritage. Retrieved 16 October 2008. ^ "Abbey Barn". Images of England. English Heritage. Retrieved 16 October 2008. ^ "Hendford Manor". Images of England. English Heritage. Retrieved 21 March 2010. ^ "Newton Surmaville". Images of England. Retrieved 25 September 2007. ^ "Octagon Theatre". Octagon Theatre. Retrieved 21 March 2010. ^ "Swan Theatre". Swan Theatre. Retrieved 21 March 2010. ^ "Table 123: South Wales and Bristol to Portsmouth and Weymouth" (PDF). Electronic National Rail Timetable. Network Rail. December 2009. Retrieved 26 May 2009. ^ "Table 160: London to Salisbury and Exeter" (PDF). Electronic National Rail Timetable. Network Rail. December 2009. Retrieved 14 December 2009. ^ "Yeovil – Yeovil Junction Station – Barwick" (PDF). Service Timetables. South West Coaches. Archived from the original (PDF) on 14 July 2010. Retrieved 28 January 2010. ^ "Forest Hill – Barwick via Borough, Bus Station, Stoford". Timetables. FirstGroup. Retrieved 26 May 2010. ^ "Yeovil – Sherborne – Wincanton". Timetables. FirstGroup. Retrieved 26 May 2010. ^ "Yeovil College". Yeovil College. Retrieved 20 January 2008. ^ "Bridgwater College". Bridgwater College. Retrieved 20 January 2008. ^ "UWE Courses at University Centre Yeovil". Retrieved 13 September 2015. ^ "England Players: Sir Ian Botham". Cricinfo. Retrieved 28 August 2009. ^ a b "Church of St John The Baptist". Images of England. Retrieved 13 July 2007. ^ "St James' Church". St James' Church. Retrieved 2 February 2010. ^ "BBC – Clubs to begin finger scan pilot". BBC News. 27 April 2006. Retrieved 6 April 2010. ^ Morris, Steven (2 May 2006). "Guardian – Fingerprint scanners call time on yobs in Britain's Wild West". The Guardian. London. Retrieved 6 April 2010. ^ "Yeovil Sports Zone". South Somerset Council. Retrieved 20 January 2008. ^ "Sport Zone consultation findings". South Somerset Council. Retrieved 20 January 2008. ^ "Protestors save Yeovil Rec". Yeovil Express. 9 January 2009. Retrieved 24 April 2010. ^ "Council wants to get Sports Zone project right – this time!". Yeovil Express. 17 April 2010. Retrieved 24 April 2010. ^ "Botham's mum opposes Sports Zone plan". Mid Devon Star. Retrieved 8 June 2012. ^ "Work to start at last!". Western Gazette. 2 February 2010. Retrieved 22 March 2010. ^ "Yeovil Town". Football Club History Database. Retrieved 11 January 2008. ^ "Yeovil Olympiads Athletics Club". Yeovil Olympiads Athletics Club. Retrieved 2 February 2010. ^ "Ivel Rugby". Ivel Rugby. Retrieved 11 January 2010. ^ Wilson, Chris (July 2011). "SW efforts bearing fruit". Forty-20. 1 (1): 37. Retrieved 14 March 2017. ^ "Goldenstones pools and leisure centre". Goldenstones pools and leisure centre. Archived from the original on 9 April 2010. Retrieved 23 March 2010. ^ "Goldenstones pools and leisure centre". South Somerset District Council. Retrieved 23 March 2010. ^ "Preston Sports Centre". 1610. Retrieved 4 January 2013. ^ "100 Local-Interest Writers And Works". South Central MediaScene. Retrieved 21 March 2010. ^ "Thomas Hardy's Wessex". University of St Andrews. Archived from the original on 5 June 2011. Retrieved 21 March 2010. ^ "Chesterfields". Cherry Red Records. Archived from the original on 13 February 2014. Retrieved 8 June 2012. ^ "Show of Hands Yeovil Town lyrics". Lyrics Mania. Retrieved 21 March 2010. ^ "The Genealogical Records of James M. & Elsie Klinger Eaves". Jim & Elsie Eaves. Retrieved 28 March 2010. ^ Arnold, Fred A (1921). An account of the English homes of three early "proprietors" of Providence. Press of E.A. Johnson & Co.
^ "Adburgham, Alison". guardian.calmview.eu. Guardian Observer archive. Retrieved 2 August 2015. ^ "Martin Cranie". Soccerbase. Retrieved 24 April 2010. ^ Sowden, Steve (19 August 2008). "Yeovil's Sam is gunning for Olympic glory!". Yeovil Express. Retrieved 2 February 2010. ^ "Jim Cregan". AllMusic. Retrieved 24 April 2010. ^ "John Parish". Last fm. Retrieved 2 February 2010. ^ "Yeovil's Sarah Parish in Blackpool". BBC. 2 December 2004. Retrieved 2 February 2010. ^ "Ancestry chart of John Turte & Katerina Holmsby". Rootsweb. Retrieved 3 December 2014. Wikimedia Commons has media related to Yeovil.